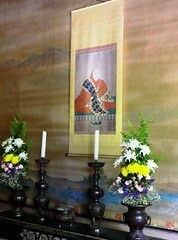 Kuro-shoin is the second of two reception halls in Goten. Kuro-shoin was used as the more formal of the two. 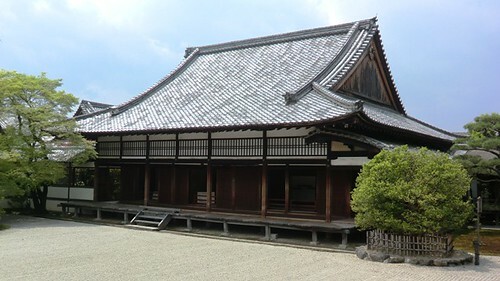 The formalities of the two rooms may be switched, but buildings with the names “shiro-shoin” and “kuro-shoin” are common in courtly architecture and can be found at other temples and palaces as well. 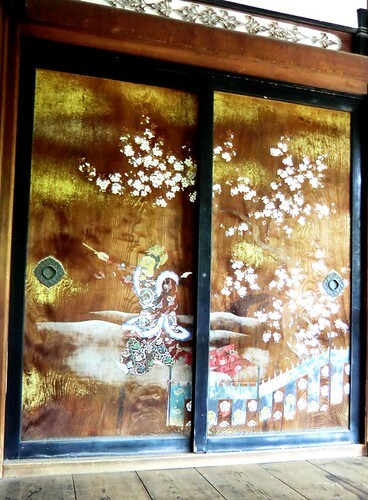 The “shiro” (“white” in Japanese) in Shiro-shoin once referred to the emphasis on unpainted woodwork in the interior of the rooms while the “kuro” (“black”) in Kuro-shoin referred to the use of black lacquer in the rooms. You’ll notice at Ninna-ji there is actually little difference in the woodwork of the two rooms now, but at one time this was a difference that set the two buildings apart and resulted in their names. Like several of the buildings in Goten, the present-day Kuro-shoin is a reconstruction. The current building was once the residential quarters at a Shingon temple named Yasui Monzeki, a temple that no longer exists today. 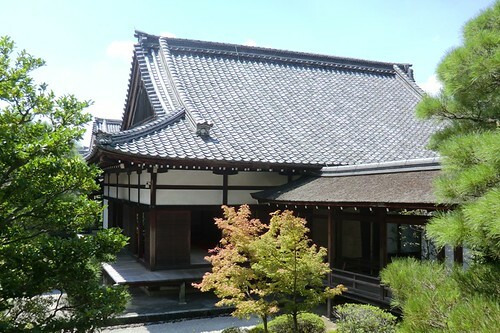 The building was moved to Ninna-ji and reconstructed with a few structural changes. The reconstruction was completed in 1909. 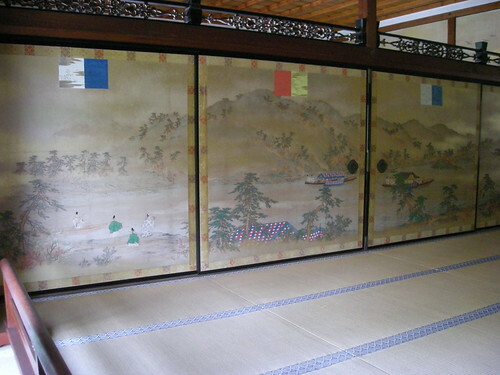 The paintings in the rooms of Kuro-shion were completed in 1937 by Domoto Inshō. The Domoto Inshō Museum (in Japanese and English) is offering free admission all month! 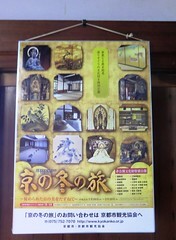 The museum is near Ninna-ji, conveniently located 3 stops away by the #59 bus at the Ritsumeikan Daigakumae bus stop. Ninna-ji often has tickets and flyers for the museum’s exhibits available near the temple shop, but this month you can visit the museum free of charge even without one of the tickets pictured to the right. In honor of the public’s efforts to conserve energy at their homes, the museum is encouraging people to gather at the museum to stay cool during the rising temperatures. 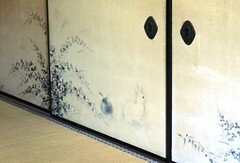 Domoto Inshō has a direct connection to Ninna-ji — he is the artist who painted the sliding panels in Kuro-shoin. He completed the paintings in 1937, a year which commemorated the 1,000th birthday of Retired Emperor Uda and the 1,100th birthday of founder of Shingon Buddhism, Kobo Daishi. 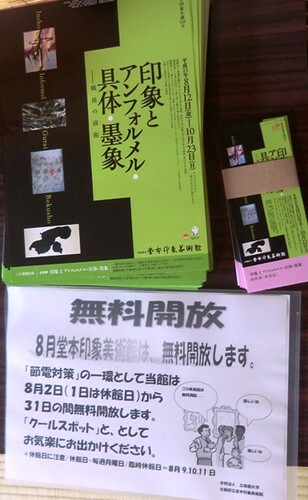 I’ll leave you with a few shots of his work in Kuro-shoin and encourage any of my readers in Kyoto during August to take advantage of the free admission and keep cool while enjoying his works on display at the museum! Ninna-ji is known as a monzeki temple. This denotes that the temple has a history of imperial family members joining the temple to become Buddhist priests. The word monzeki was also used to refer to the former emperor or prince who had become the head priest of the temple. 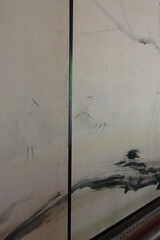 As you come around the back of Shinden and turn to see the North Garden on the other side, this painting stands to your left. Before moving on to look into the interior rooms of Shiden, be sure take a look at this painting which depicts a dancer performing under cherry blossoms to imperial court music known as gagaku. 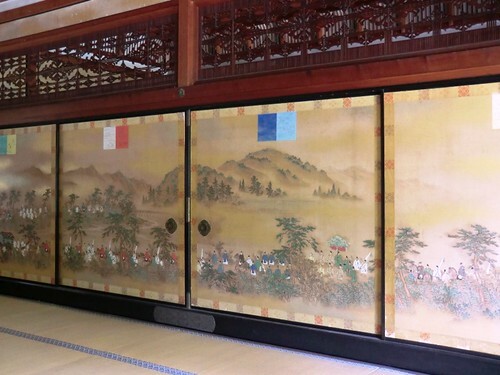 On the wall opposite of the Mifune Festival painting in the middle room of Shinden there is a painting of Aoi Festival as a representation of summer. Aoi Festival is one of the three big festivals in Kyoto (the other two are Gion Festival in July and Jidai Festival [Festival of Ages] in October). “Aoi” means “hollyhock,” and the namesake of the festival can be seen in the form of hollyhock leaves adorning both people and animals in the famous procession. The festival is held annually on May 15th, and features many people in Heian Period costumes and even horses and oxen. The procession starts at Kyoto Imperial Palace and continues on to Kamigamo Shrine after passing through Shimogamo Shrine. You can find a map of the parade course and times of arrival here (English & Japanese). 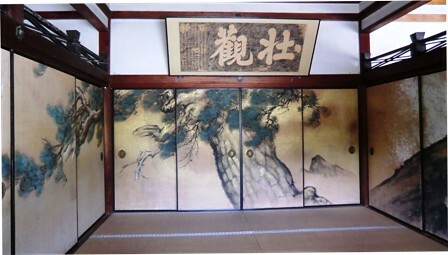 The three main rooms of Shinden (the residential quarters inside of Goten) all feature wall-paintings that depict one of the four seasons. On the left-hand side of the center room, the above painting can be seen depicting an autumn scene. 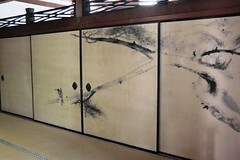 The festival illustrated by the painting is Arashiyama’s Mifune Festival. Long ago, when Emperor Uda visited Arashiyama, the people of the area held an event on the river for him, and that event would eventually be the inspiration for Mifune Festival. The original event was in the fall, but now the festival is held by Kuruma-zaka Shrine in May. The festival is held on the 3rd Sunday of May, this year on the 15th. The festivities start at high noon at the shrine, and continue into the afternoon with a parade of people in Heian Period costumes and old-fashioned boats on the river. You can find more about the festival at the shrine’s website here. After learning about Mifune Festival here at Ninna-ji, I think I’ll try to go this year. If you can’t make it to the festival in person, come to Ninna-ji to see the painting in Shinden for a taste of the festival any time of year!